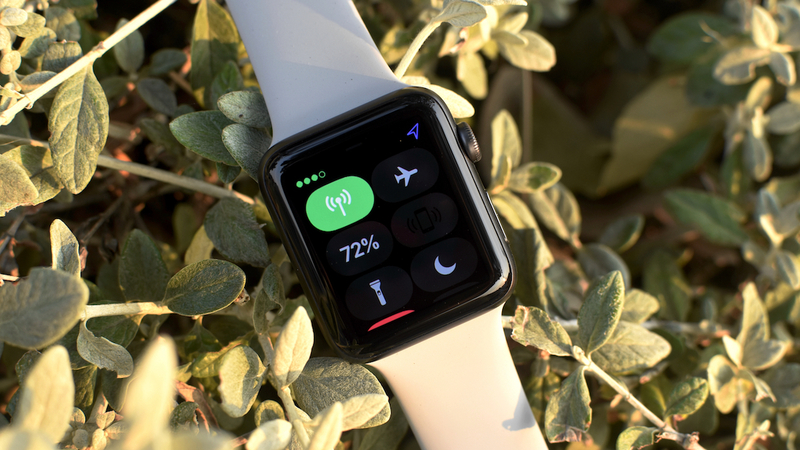 The Apple Watch depends on an iPhone for a lot of things, with its Bluetooth connection acting as an umbilical chord for notifications and Apple Watch apps. However, its smarts aren't completely lost if you happen to leave your phone behind. Apple has added LTE to the Watch equation with Series 3, building upon GPS and waterproofing and making it possible to do even more without being tethered to your iPhone. Read on for a full round up of all the things your Apple Watch can do when you leave its big brother at home. All of the Apple Watch's tracking features carry on working without a phone around, with the Workout app keeping tabs on your, erm, workouts, while your daily fitness goals are monitored through the Activity app. The Apple Watch will also still tell you to stand up at various intervals, while Series 2 and 3 owners can track location on a run through GPS or their swims in the pool. With LTE, some workout apps are also a little smarter. For instance, you can download audio guides for Nike Run Club while you're out, about, and without your iPhone. Bonus: Take a look at our pick of the best Apple Watch running apps. Once watchOS 4.1 is available to all, and if you have a Series 3 with LTE, you'll be able to stream Apple Music wherever you go. This way, you don't have to rely on the limited amount of storage space on your Watch if you want to go phone-free. Of course, if you don't want to pony up the money for LTE every month you can also just sync over music for phone-free situations. It's easier than ever with watchOS 4, too, as you can easily sync over artists, albums, songs and more. You will, of course, have to connect some Bluetooth headphones too. Thanks to LTE, you'll be able to keep track of all your precious blue-bubble friends via iMessage. You'll have to scribble out all your responses, but you can still do it. Additionally, you can take some calls and check in with families. Now, this doesn't work for all messaging and calling apps - yet, that'll have to wait until developers start updating apps to be standalone first. As long as you've already set up your Apple Pay credentials using an iPhone, you can make actual payments with the Apple Watch on its own. There's a secure token stored on the timepiece itself that proves you are who you say you are, but as a security measure it only works if it's in contact with your skin (take it off and you need to reconnect with your iPhone) and if you have a passcode. For more on Apple Pay, read our complete guide on the service. As with music, there's a small sliver of storage space given over to your photos — if you want to make sure that pictures of your nearest and dearest are with you at all times, then Apple Watch makes it possible. By default, the Favorites album on your iPhone is synced over to the watch, but you can change this through the Apple Watch app on your mobile: creating a dedicated album for timepiece pictures is probably the best option. When running the watch on LTE or Wi-Fi you can use Siri to message friends, call people or even just set alarms and timers, but you can also use her to ask questions. Because she can speak back to you, either out of watch's speaker or paired headphones, it makes the whole package feel a little more futuristic, though it is held back a little by Siri's current limitations. You can also use one of our favorite Apple Watch apps, Just Press Record, to record things on your Watch. It's a standalone app now, and it'll instantly transfer your recording up to the cloud via LTE. You won't be able to transcribe without an iPhone, but you can record discreetly in the background as you do other things. Your movie tickets, loyalty cards, boarding passes, and money-off vouchers are right there on your wrist when you need them, even if you've accidentally lost your smartphone (or smashed it on the way to the airport). All of the usual watch features are still available on the Apple wearable, so your alarm will still go off even if your phone is out of battery or has wandered away during the night. Nightstand mode also makes the Apple Watch even more useful as a miniature alarm clock. Other related functions, such as the watch timer and the stopwatch feature, work fine without a connected iPhone in range. Good news: the Apple Watch does indeed still function as a watch if you lose your iPhone - so you can find out how long it's been since you last checked Facebook. It's not just telling the time either - Apple promises that the device keeps time within 50 milliseconds of the definitive global standard. Your only worry then is the battery running out, at which point you'll need to use the position of the sun instead.